, a learned German divine and reformer, was born Jan. 8, 1478, at Ruffach, in Alsatia. His family name was Kursiner, or Kirsner, but the name Pellican, which means the same thing in Latin as Kirsner in German, and is in neither very significant, was given him by his maternal uncle. 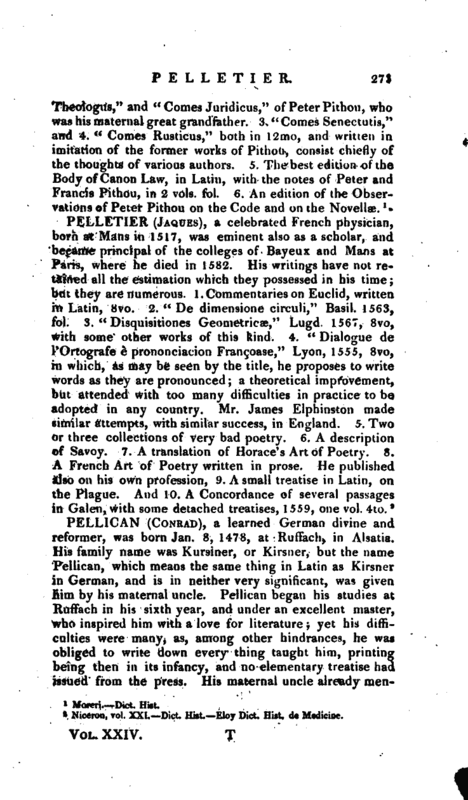 Pellican began his studies at Ruffach in his sixth year, and under an excellent master, who inspired him with a love for literature; yet his difficulties were many, as, among other hindrances, he was obliged to write down every thing taught him, printing being then in its infancy, and no elementary treatise had issued from the press. His maternal uncle already | mentioned, who lived at Heidelberg, and had often been rector of the university, hearing of the progress his nephew made in his studies, sent for him to that seminary, where he applied to the belles lettres and logic for about sixteen months, which was probably as long as his uncle could afford to maintain him. He returned therefore in Sept. 1492 to his parents, who were poor, and could give him little support, but got some employment as assistant to a schoolmaster, and had, what was then of great importance to him, the power of borrowing books from the convent of the Cordeliers. His frequent visits for this purpose brought on an acquaintance with those holy fathers, who conceived a very high opinion of Pellican, now in his sixteenth year, and appear to have found little difficulty in persuading him to enter their order, which accordingly he did in January 1493, but against the consent of his relations. He then commenced his theological studies, and in the following year was admitted to the order of subdeacon. In 1496, at the request of his uncle, he was sent to Tubingen, and recommended to Paul Scriptor, a very learned professor of philosophy and mathematics, under whom he profited much, and who conceived a great affection for his pupil. 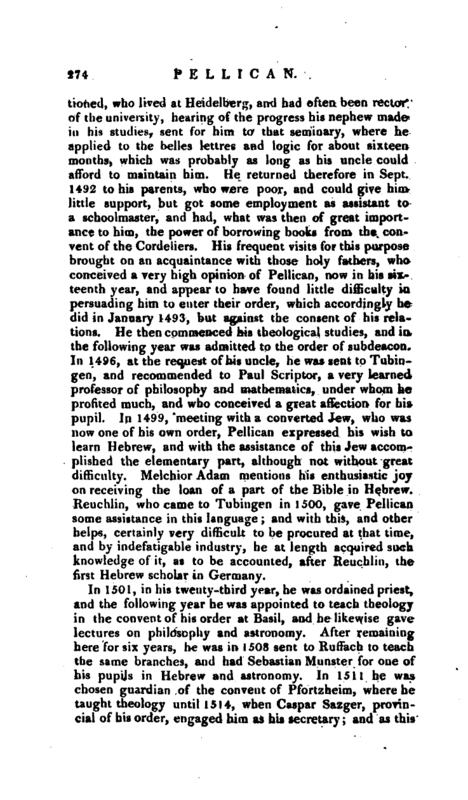 In 1499, meeting with a converted Jew, who was now one of his own order, Pellican expressed his wish to learn Hebrew, and with the assistance of this Jew accomplished the elementary part, although not without great difficulty. Melchior Adam mentions his enthusiastic joy on receiving the loan of a part of the Bible in Hebrew. Reuchlin, who came to Tubingen in 1500, gave Pellican some assistance in this language; and with this, and other helps, certainly very difficult to be procured at that time, and by indefatigable industry, he at length acquired such knowledge of it, as to be accounted, after Reuchlin, the first Hebrew scholar in Germany. In 1501, in his twenty-third year, he was ordained priest, and the following year he was appointed to teach theology in the convent of his order at Basil, and he likewise ’gave lectures on philosophy and astronomy. After remaining here for six years, he was in 1503 sent to Ruffach to. teach the same branches, and had Sebastian Munster for one- of his pupils in Hebrew and astronomy. In 1511 he was chosen guardian of the convent of Pfortzheim, where he taught theology until 1514, when Caspar Sazger, provincial of his order, engaged him as his secretary; and as this | office required his attendance on the provincial in all his journeys, Pellican had many opportunities of becoming acquainted with the learned of his time, and particularly of transcribing from the libraries whatever might add to his stock of oriental and biblical literature, which appears now to have been the fixed object of his studies. On his return from Rouen, where he had been to assist at a chapter, he stopped three months at Basil, with leave of the provincial, to superintend an edition of the Psalter in four languages, which Froben had then at press. He is not altogether to blame, however. 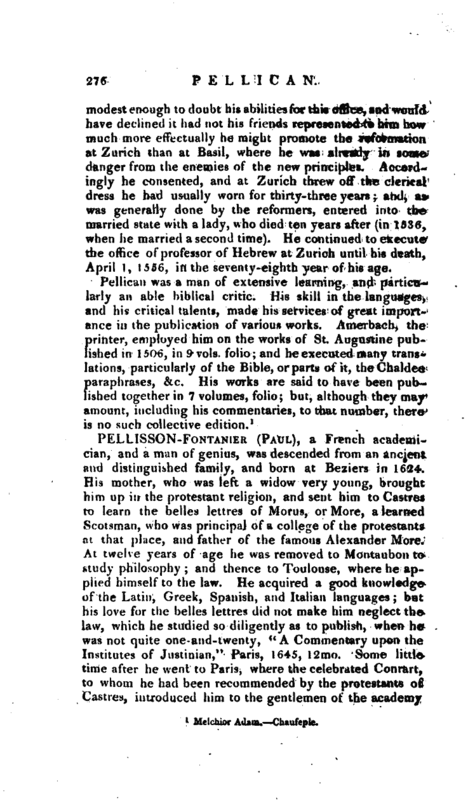 The life given by Melchior was written by Pellican himself, and is upon the whole a very interesting one. in his account of Pellican’s journeys with the provincial, little of which is interesting. It appears to have been in 1519 that he was appointed guardian at Basil, and where he met with the writings of the illustrious Luther, which, some say, converted him to the protestant faith; but it would be more correct to say that they served to confirm him in certain sentiments which he had for some time entertained, and was now so little afraid of avowing, that in 1522 he was accused of Lutheranism in a chapter of his order. By what means he defended himself we are not told, but it was with such success, that he obtained permission for some of the ablest of the students and preachers to read the works of Luther. 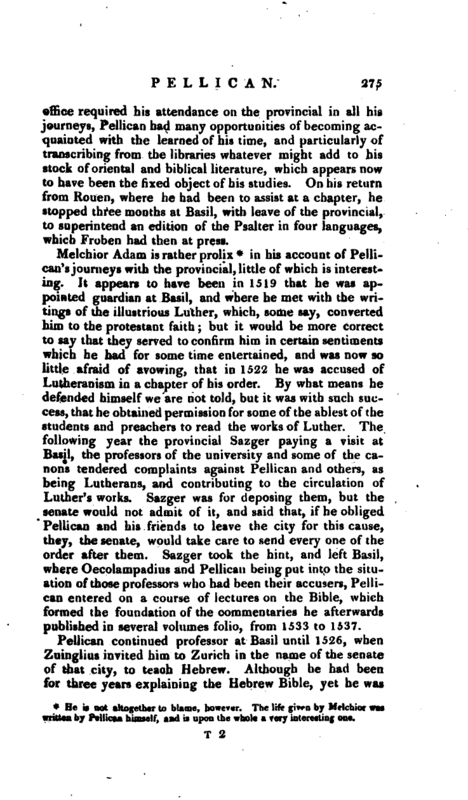 The following year the provincial Sazger paying a visit at Basil, the professors of the university and some of the canons tendered complaints against Pellican and others, as being Lutherans, and contributing to the circulation of Luther’s works. Sazger was for deposing them, but the senate would not admit of it, and said that, if he obliged Pellican and his friends to leave the city for this cause, they, the senate, would take care to send every one of the order after them. Sazger took the hint, and left Basil, where Oecolampadius and Pellican being put into the situation of those professors who had been their accusers, Pellican entered on a course of lectures on the Bible, which formed the foundation of the commentaries he afterwards published in several volumes folio, from 1533 to 1537. Pellican continued professor at Basil until 1526, when Zuinglius invited him to Zurich in the name of the senate of that city, to teach Hebrew. Although he had been for three years explaining the Hebrew Bible, yet he was | modest enough to doubt his abilities for this office, and would have declined it had not his friends represented to him how much more effectually he might promote the reformation at Zurich than at Basil, where he was already in some danger from the enemies of the new principles. Accordingly he consented, and at Zurich thivw off the clerical dress he had usually worn for thirty-three years; and, as was generally done by the reformers, entered into the married state with a lady, who died ten years after (in 1536, when he married a second time). He continued to execute the office of professor of Hebrew at Zurich until his death, April 1, 1556, in the seventy-eighth year of his age.